“We want technology to be almost a thoughtless, seamless process. 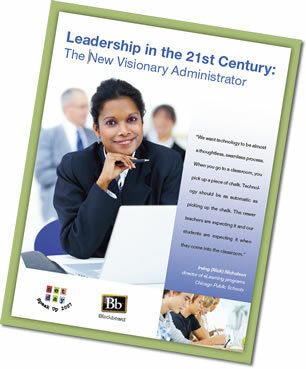 Project Tomorrow and Blackboard released Leadership in the 21st Century: The New Visionary Administrator during a breakfast meeting at the NSBA T+L 2008 ConferenceT+L (Seattle, WA) Wednesday, October 29, 2008. This new report, based on the Speak Up 2007 School Leaders Survey, examines school and district administrators’ attitudes about technology and learning. The report highlights several Visionary Administrators who have more in common with students than with fellow administrators in terms of technology use and priorities for technology in instruction. 95% of tech visionaries believe that using technology improves student achievement. 73% report that integrating mobile devices will increase student engagement. Tech visionaries are twice as likely as their peers to use technology, closing the digital disconnect gap with students. For example, tech visionaries are more likely than students to remix content (29% vs. 20%) and read or post blog or wiki entries (56% vs. 19%). Tech visionaries are leading the introduction of online learning and mobile devices into the classroom by supporting teacher exploration of new tools. Over half of all tech visionaries say that they would provide or expand online courses to keep students engaged in school. Click here to download a copy of the report, which was released on October 29th, 2008.